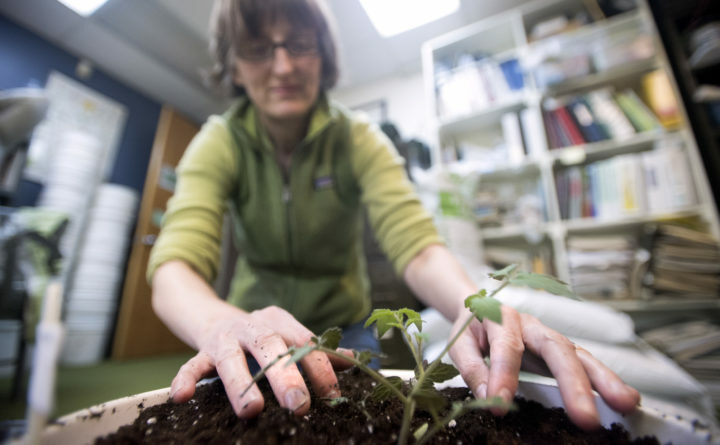 Kate Garland horticulturist at the University of Maine Cooperative Extension plants a tomato seedling into a bucket while talking about container gardening, May 16, 2017. “A cooperative extension is difficult to define in simplistic terms because it’s many things to many people,” Dan Goerlich, associate director for economy, community and food at the Virginia Tech Cooperative Extension, said. At the most basic level, cooperative extensions are part of each state’s land grant university, which were initially designated in the mid-1800s to focus on science, engineering and agriculture education. The Cooperative Extension System was created in 1914 by the Smith-Lever Act to connect these institutions — their research, information and educational programs — to the community to meet their needs. Each state has a cooperative extension system, with roughly 3,000 local extension offices nationwide. The exact services offered by a cooperative extension will vary based on the area. Extension agents or educators will often conduct community assessments to determine what information and education the area needs. Cooperative extensions provide classes, written publications, and events on a wide range of topics, including gardening, beekeeping, food preservation, livestock management and food safety. Youth development programs such as 4-H also are run through cooperative extensions. Cooperative extensions can be a lifeline for new homesteaders. Not only do cooperative extensions provide a wealth of information, but homesteaders can also call their local extension agents and educators to answer their questions about gardening, farming and more. Upon request, cooperative extension agents and educators will even come to your property to conduct a soil survey, determine what crops would be best for your homestead and help you develop a management plan. “Because we do touch all the areas of the food system, we can help people get in touch with different agencies and resources that can help them,” Lisa Phelps, interim director at the University of Maine Cooperative Extension, said. According to Phelps, the best way to get in touch with your cooperative extension is through your state’s land-grant university or by visiting the website for the eXtension Foundation, an organization aimed at increasing the visibility of the Cooperative Extension System, to find your local extension office. Each state cooperative extension system also maintains their own web page that contains contact information for local offices as well as educational publications and materials. Even urban homesteaders can call their closest cooperative extension office to answer their questions. When the Cooperative Extension System was created, more than 50 percent of the U.S. population lived in rural areas. Today, only 17 percent of Americans live in rural areas. Still, there are cooperative extensions in counties across the United States, including cities such as New York, Austin and Los Angeles. The Cooperative Extension System was designed to adapt to the changing landscape.